Queer in STEM: Preliminary results: Who answered the survey? 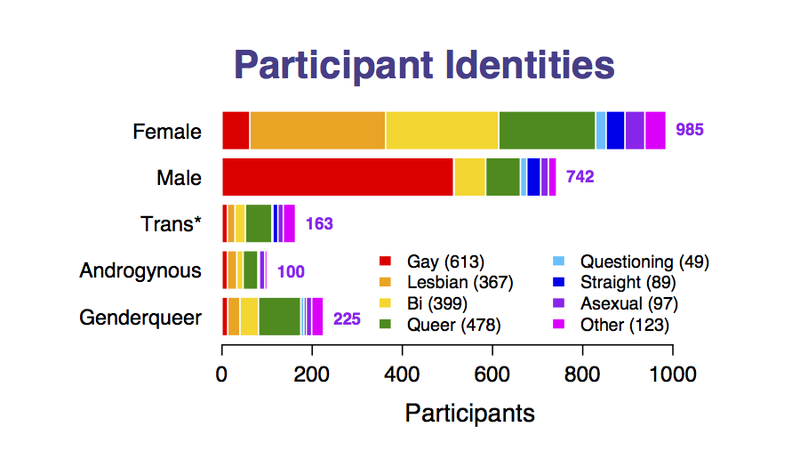 A total of 1,443 people completed the Queer in STEM online survey. Participants indicated a wide range of gender identities and sexual orientations, which are illustrated in the figure below. We’re glad to see so much participation by folks who identify outside the gender binary! Of the survey participants, 985 identified as female, 742 as male, 163 as transgender, 100 as androgynous, and 225 as genderqueer. Asked about their sexual orientations, 613 participants identified as gay, 367 as lesbian, 399 as bisexual, 478 as queer, 49 as questioning, 89 as straight, 97 as asexual, and 123 selected a term other than the ones we offered in the multiple-choice question. We’re particularly glad to have so many participants identifying as asexual, thanks to promotion of the questionnaire on the Asexual Visibility and Education Network—this is an identity that isn’t yet very well represented in the social science literature. Participants came from across the United States and the around the world. 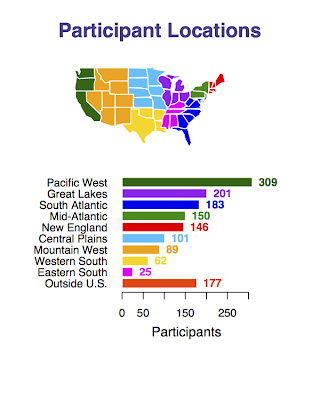 The single region with the most participants was the Pacific West—including the West Coast states, Alaska, and Hawaii. 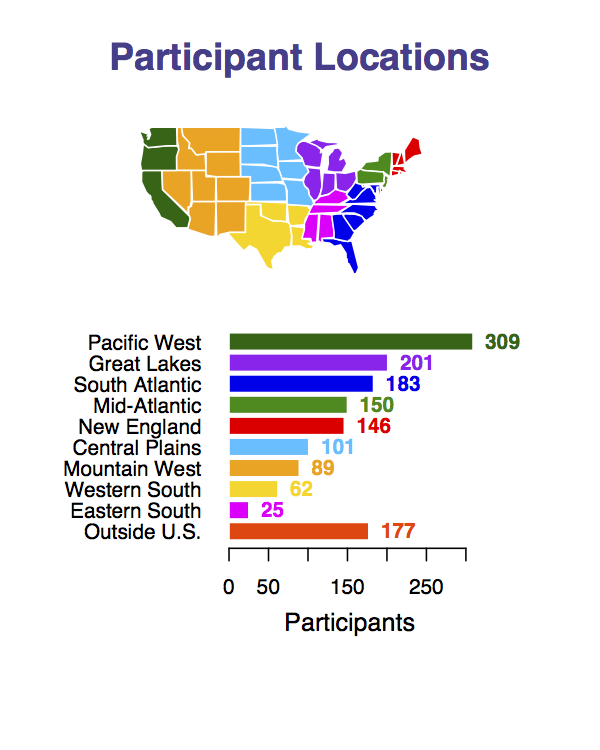 New England, the Mid- and South- Atlantic, and the Great Lakes were also well represented, suggesting that our participants’ distribution generally reflects the major centers of population density in the U.S. The fourth-largest group of participants were those living outside the U.S.—most of these were from Canada, but places written in included the U.K., Germany, India, and Southeast Asia (some of these participants are U.S. citizens working overseas). Survey participants represented a broad range of ages and educational attainment. 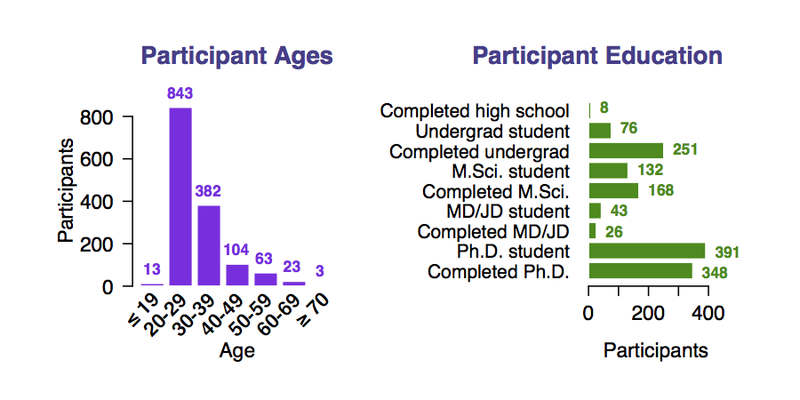 However, a solid majority of participants (843) were between the ages of 20 and 29, and about half were either currently earning a Ph.D. (391) or have already completed one (348). We invited respondents to self-identify their race/ethnicity using terms from the U.S. Census, allowing for the selection of multiple categories. Of respondents who chose to answer this question, 1,225 identified as white, 134 as Asian, 89 as Hispanic/Latino, 37 as black or African-American, 17 as American Indian or Alaska Native, and 5 as Hawaiian or Pacific Islander. These data suggest that our sample reflects the over-representation of white people in both higher education and in STEM fields requiring advanced degrees, which is documented in many other reports. In our follow-up open-ended questions and interviews we addressed issues of how race and ethnicity impact individual experiences, and examined the differential ways in which these identities intersect with age, career stage, STEM field, and gender and LGBTQ identities. 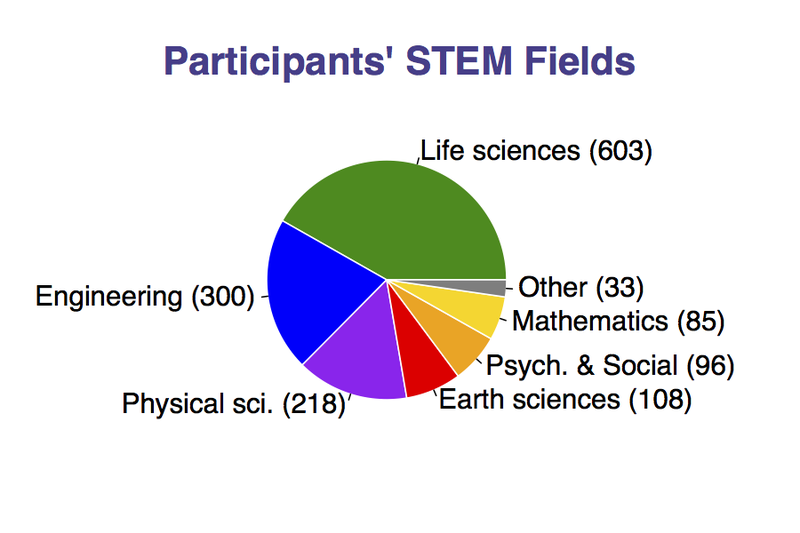 Finally, what STEM fields did questionnaire participants represent? The single biggest group of participants (603) work in some form of life science, followed by engineering (300), and physical sciences (218). Our qualitative data—the e-mail questions and the interviews—include responses from people working in all of these fields and many subspecialties. Our preliminary analyses suggest there are some important differences among these different STEM fields, and we look forward to sharing information about how those fields currently viewed as less welcoming could adopt positive practices reported as more common in other areas of expertise. We are very happy to have heard from so many people and are excited to begin sharing additional findings as we move forward with analysis. Thanks again to everyone who shared information about their lives with us!